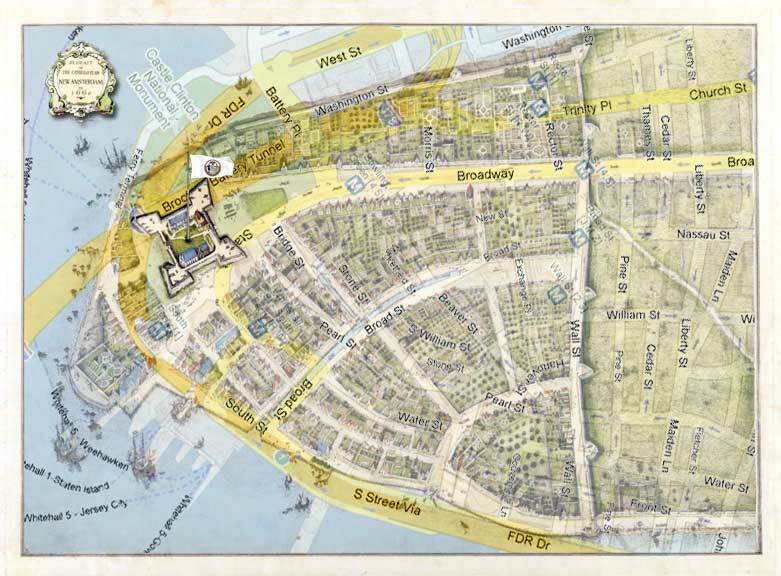 Fort Amsterdam is a GPS-based multi-player game played with mobile phones, in which players get transported back 400 years to a time when New York was called New Amsterdam. Fort Amsterdam was a fort on the southern tip of Manhattan that marked the official founding of New York City with a mission of protecting the New Netherland colony operations in the Hudson River against attacks of the English and the French. Fort Amsterdam will be played at the Come Out & Play Festival in New York on june 7th 2008. In the game the defenses of the fort have just been breached and Dutchmen, Englishmen and Manahatta Indians are scattered throughout the fort fighting each other. You can be either Dutch, English or Manahatta – the objective is the same: to conquer the fort by beating the opponents , outsmarting them, outrunning them and destroying them on the way to capture the original flag of New York. The game is played by three teams of 6 to 10 players. Each team is divided into 2 battalions: the Scouts and the Infantry. The game starts in a central location in down town Manhattan. In the center of the Square a flag is positioned to represent the fort. In the first 45 minutes of the game, the 2 battalions each have their own tasks. 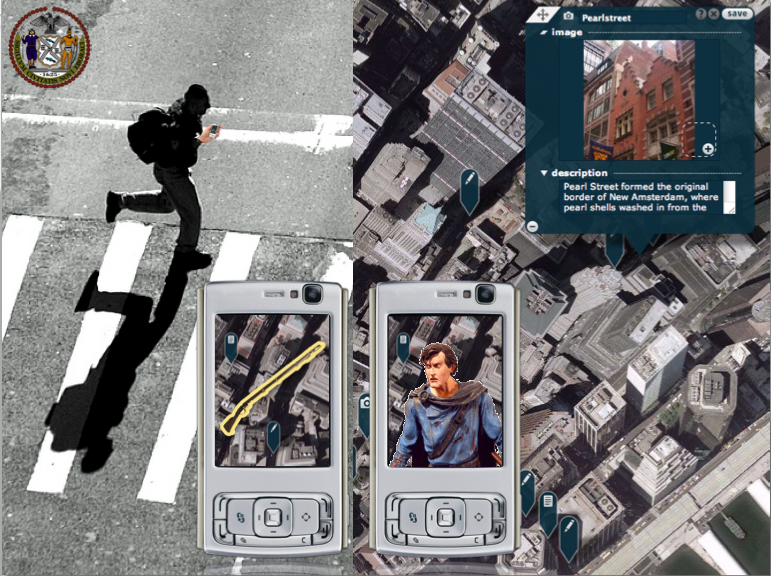 The Scouts run around downtown to hit as many tactical places shown on a map on their mobile phones. The locations they see depend partly on their nationality so not all teams see the same. At these locations different things (triggered by GPS) can happen. You can pick up virtual weapons or if you know your trivia and pay attention to your surroundings, you can answer questions to get even bigger weapons and score extra points. Speed is the key for these teams as they run to collect as many points and weapons as they can to make their army as strong as possible. But beware – you might run into foreign Scouts in the streets, and will have to hide or defend yourself for points. The team with the best weapons always wins. While the GPS team members roam through lower Manhattan collecting points and weapons, the teams that are left physically prepare the final battle on the square. Around the square they build barricades – holding either the Dutch, English, or Manahatta flag – , prepare tactics and construct weapons and objects to use in the final battle. After 45 minutes time’s up and the points and weapons are counted and traded for real ammunition. The ammo consists of water filled balloons and other throwable objects to help your team or to defeat the other. From this point on it will be a simple game of capturing the flag. All teams try to get to the flag without getting hit; once you’re hit you’re out. The first team to take the flag back to their fort wins the Battle of Fort Amsterdam, if you get hit bearing the flag, you have to drop it at the point where you’re hit. At the Come Out & Play headquarters the progress of the game can be seen live as the positions of all players are visible on the game website. After playing, all game play can be played back on the website so players can discuss their winning (or loosing) tactics. The Fort Amsterdam game is a warm up to the 2009 Hudson year where New York and Amsterdam celebrate their 400-year anniversary and a larger game is planned taking place in both cities simultaneously. The game format is part of a location-based gaming platform called 7scenes and these types of games are currently created and played by children in high schools in Amsterdam. The actual game content described above is specific for this game.